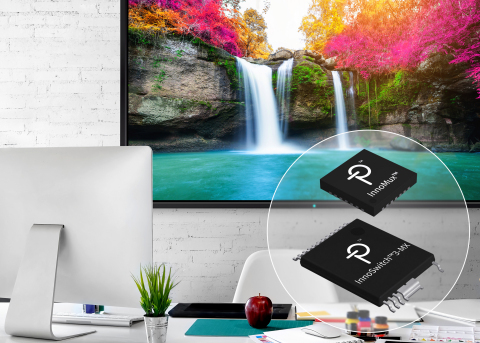 Power Integrations (News - Alert) (Nasdaq: POWI), the leader in high-voltage integrated circuits for energy-efficient power conversion, today announced the release of the InnoMux™ chipset for display power supplies. The chipset's unique single-stage power architecture reduces losses in display applications by increasing overall efficiency in constant-voltage and constant-current LED backlight driver stages by 50% compared to conventional solutions, achieving up to 91% efficiency. Additionally, TV and monitor designers can realize over 50% reduction in component count, reducing manufacturing cost and providing an associated improvement in board reliability. The new chipset consists of an InnoMux controller IC partnered with an InnoSwitch™3-MX isolated switcher IC. The InnoSwitch3-MX is the latest addition to Power Integrations' flyback switcher IC families, combining the primary FET, the primary-side controller, a secondary-side controller for synchronous rectification, and FluxLink™ high-speed communications technology, which eliminates the need for an optocoupler. The InnoSwitch3-MX receives control information from the InnoMux IC, which independently measures the load requirements of each output and directs the InnoSwitch3-MX switcher to deliver the right amount of power to each of the outputs to maintain accurate regulation of current or voltage; this eliminates the load and cross-regulation challenges seen with conventional multi-output power supplies, making post-regulators unnecessary. Overall power conversion efficiency increases by 10%, removing the need for heatsinks and eliminating hotspots while easing compliance with the upcoming ENERGY STAR (News - Alert)® 8.0 display specification and the new CEC power-consumption standard scheduled to take effect in July 2019. Uniquely, InnoMux technology supports both accurately regulated constant-current and constant-voltage outputs simultaneously, supplying one to four channels of constant-current and up to two constant-voltage outputs. This flexibility supports the logic, audio and LED requirements typically seen in TV and monitor displays. The IC provides overload protection for each output. InnoMux technology also supports sophisticated dimming on the LED CC output - analog, PWM, interleaved and hybrid dimming are controlled via dedicated analog and PWM control pins, allowing accurate dimming down to 1.5%. Comments Edward Ong, product marketing manager at Power Integrations: "Developers can leverage InnoMux's power conversion efficiency in two ways: they can develop highly efficient monitors and TVs to meet manufacturer targets and regional regulatory mandates, or they can downgrade the efficacy, and therefore the cost, of their display panel by using less expensive LEDs and simpler, cheaper, diffusers while still meeting upcoming ENERGY STAR 8.0 rules." Power Integrations, Inc. is a leading innovator in semiconductor technologies for high-voltage power conversion. The company's products are key building blocks in the clean-power ecosystem, enabling the generation of renewable energy as well as the efficient transmission and consumption of power in applications ranging from milliwatts to megawatts. For more information please visit www.power.com.